That's the one pervasive thought running through our minds after finishing the final chapter of the Uncharted franchise. With those credits rolling, we're left trying to catch our breath. We've just been treated to some of the most elaborate and adrenaline-mainlining action sequences ever coded, new yet totally vital platforming mechanics that work in tandem with a fresh, open perspective on level design, and a fittingly Naughty Dog conclusion to the Uncharted saga. Uncharted 4: A Thief's End is, without a hint of hyperbole, one of the best games you'll ever play. On a sheer visual level alone, ND has shown us just what PS4 can really do. With only the rarest drop in frames, we're treated to rolling vistas that put previous entries to shame, the sheer power of current-gen tech offering the most filmic interactive experience we've ever seen. Even the facial movements of each character overshadows the likes of Batman: Arkham Knight and the impressive Quantum Break - lines tightening in Drake's eyes as he smiles, muscles stiffening under skin during combat and almost perfect lip-syncing. Like practically everything ND does, it's a masterclass in virtual craftsmanship. Oh and the lighting. Just look at that lighting! You can feel the DNA of previous games running through the cells of Uncharted 4 at every turn, too. 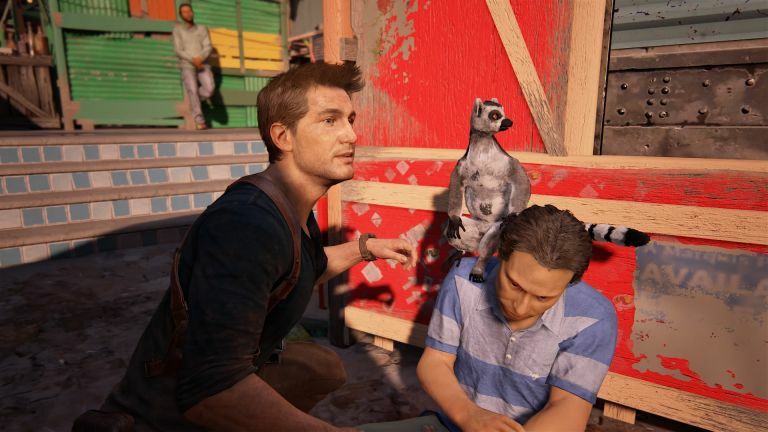 From grin-inducing Easter eggs placed front and centre to moments reminiscent of those classic Uncharted moments (yes, a giant armoured car will chase you more than once and yes, you'll almost certainly have to climb up a vehicle while it hangs over a cliff), Uncharted 4 feels less like a best of and more of heartfelt remembrance of a storied history. The Last of Us is here too, living in the quiet and effective moments - co-directors Neil Druckmann and Bruce Straley bringing a potent human drama that helps bring the Uncharted narrative to its most logical conclusion. We don't have our emotion glands shredded in the way Joel and Ellie's adventure did, but we do see Drake, Elena, Sully and co with new eyes, adding an emotional resonance that makes previous entries seem like sitcoms by comparison. It doesn't all work, though. Sam, Drake's hitherto unmentioned older brother, isn't the revelation we were hoping for. As you fight, climb, drive and swing your way through Nate's final adventure the elder Drake never feels like a vital part of the Uncharted mythos - neither charming nor particularly interesting (even with the dependable Troy Baker under his skin) Sam ultimately feels surplus to the needs of the story and ND's desire to flesh out Nate by contrasting his journey against another. As nullifying as Nate's brother can be, the adventure you'll face together is breathtaking. Sure, there's still the over-reliance on a gunplay that still doesn't feel wholly satisfying but there's just so much else to do. A new grappling hook adds brilliant rope swinging action to the mix, while a picot (think Lara's pickaxe from the rebooted Tomb Raider) and lots of sliding down slopes turns the environmental platforming into something akin to Prince of Persia's juggling acrobatics. That nod to Lara continues with levels that are satisfyingly open-ended (rather than open-world), offering multiple ways to tackle areas that would normally just descend into cover-based mundanity. It's there too in the more elaborate climbing mechanics - although we're pleased ND didn't end up forcing in a pointless XP system or unnecessary crafting. Instead, we're left with an Uncharted game that takes everything the series does so well and amplifies it - bigger levels, more elaborate set-pieces and more - while subverting many of the tropes the series has come to rely on over the last decade. Even the addition of a jeep - which leads to some impressively grand, Metal Gear Solid 5-esque open areas that reward explorers with secret ruins and treasures - feels perfectly attuned to the series. ND also pull of something Rocksteady failed to do with Arkham Knight - rewarding vehicular platforming! Uncharted 4 does feel a little too long in places, and ultimately you could probably shave off a couple of chapters and not lose any of its potency, but that doesn't mean you'll ever be bored playing it. Not for a second. This really is one of the best games you'll ever play, an instant classic that'll rightfully live long in the memory.